David Simon’s timely portrait of a crumbling Baltimore newspaper in season five of The Wire featured a young journalist, Alma Gutierrez, and a desperate early-morning hunt to see her story in print. A search that eventually brought her to the printing press and a glimpse of the first edition. That experience may soon forever be replaced by the impenetrably unromantic chore of repeatedly clicking a browser’s ’refresh’. Despite this, news organisations are still almost entirely reliant on print mechanisms for generating revenue. This does not bode well for Newsweek. Ad revenues are down, paywalls faltering, subscription services finding only partial success. In short, the newspaper industry, web producers of all shapes and sizes, must find a new way to achieve financial independence. Recently, executive editor of investigations David Leigh of the UK Guardian, made an impassioned case for a new model to fund journalism. A necessity made all the more significant considering rumours (quickly denied by Guardian editor Alan Rusbridger) that the paper plans to go web-only in the near future. With traditional revenue sources dwindling, Leigh rightly reached back into a recent past where newspapers weren’t just content producers, they were printers and distributors. Leigh recognised an inherent unfairness in the current internet model. The potentially infinite canvas upon which ideas can be enticingly displayed is controlled by an industry with little or no hand in the creation of the content which brings it to life. This industry, dominated by telecommunications corporations such as AT&T, Telefónica, Vodafone etc, operating under strictly controlled state regulated licensing, profit from the provision of access to other people’s content. They own a theme park without any rides. Leigh, in response to this inequity, suggested a flat tax on broadband, modeled on the UK TV licence system. The revenues would then be distributed by a regulator to content providers, such the Guardian and it’s competitors. Leigh calculated that a levy of just £2 on mobile and broadband subscriptions would raise more than £500m annually, a significant windfall to major media players and local newspapers alike. Hard news, he imagined, would survive on the back of government taxation. It’s fair to say Leigh’s proposal didn’t shake the earth – few even toyed with it. Where they did, it was criticised variously as ‘dumb’, ‘stupid’, ‘bonkers’. News International’s customer management director Chris Duncan called the idea “lunacy”, saying it “disincentivises all paid content conversion”. Press Gazette editor Dominic Ponsford rubbished the plan, before declaring that a share in Google’s ad revenue was the real prize – although that’s an expectation Richard Gingras (Google’s head of news and social products) has already poured cold water on in a recent talk at Standford university. Leigh’s one prominent defender was Roy Greenslade, the former Daily Mirror editor and his colleague at the Guardian. Greenslade wondered aloud, ”Could this be the magic bullet we’ve been seeking?”, before concluding, ”I certainly think so…”. Of course, there is no magic bullet in Leigh’s idea. Why should news organisations be valued over any other type of content providers? Why shouldn’t all web content creators profit from a levy on broadband, whether they be social networking sites, video hosting, blogging platforms, chat forums, online gaming or even ‘adult’ websites? While the idea’s simplicity may be appealing, it is both unfair and unworkable. However, that is not to say we should reject it entirely. Advertising versus sales has been the dominant economic paradigm for a hundred years, with publishers and editors aware of the challenges and compromises inherent in relying too heavily on either one. But this paradigm is no longer sustainable. Take the New York Times (NYT) for example, according to the Guardian, despite circulation being up 7% versus last year, “circulation figures no longer offset the loss in advertising”. Ad revenues are down 9% across the board, with an 11% drop in print ads. Meanwhile digital is “off by -2.2%”. Strong growth in digital edition subscriptions aside, this is not a rosy picture. Just recently, the pressure to drum up advertising revenues was highlighted by – interestingly in this context – a Vodafone advertising campaign. The £4m campaign – designed as a pre-emptive strike against EE, who are soon to benefit from being the first telecoms company permitted by licencing regulators Ofcom to launch 4G services in the UK – saw the Daily Telegraph, Guardian and Independent running full front and back page cover wrappers. A first for UK daily broadsheets. The move showed a troubling willingness not only to give up the front page, the traditional home of the big news of the day, but also to dilute their brands to secure advertising revenues. Evidence of an accelerating harmonisation between the ad and news worlds abound; each week sees ever more brash incursions by marketeers into the realm of publishing. Just last week Forbes editor Lewis DVorkin called for a normalisation of “brand journalism”, otherwise known as sponsored content, proving that in these lean times the industry’s cherished editorial firewall no longer sits on solid foundations. Thankfully though, while Leigh may not have fired the magic bullet, he certainly aimed at the right target. Broadband, and the wider data market, may well hold the key to shirking this ad dependency. Imagine a scenario where the theme park ride-creators and operators shared in the takings at the gate. A scenario where mobile operators pay commission to web content creators for the sale of internet data packages. The NYT for instance sells a ‘NYT Data Package’ to its readers; the data is supplied by a mobile operator, who then pays a percentage commission to the NYT, a ‘Data Share’. In effect, content providers would act as sales representatives on behalf of mobile operators, the agreement for which would be established through an online marketplace. For clarity, the data does not have to be used on the package sellers website, it is merely a brick with which the data user builds their data allowance. Eventually every content creator would be in a position to sell their own data packages (on behalf of multiple operators in various countries), and mobile users would build their data allowance from their preferred data packages. The packages can be incentivised by any number of means. For example, it may be possible to offer package users an agreement that no data is used while visiting those sites. It may include access to exclusive content, priority updates, additional services, more profile pages, greater storage or hosting allowance, ad-free services etc. Mobile users could, in effect, build their mobile (and potentially home broadband) data allowance using packages from their favourite websites – 200MB for Youtube, 100MB for Facebook, 100MB for their local and national news content providers etc. Mobile data providers for their part would compete by securing the most competitive, incentivised packages for their users, with content publishers selling their packaged brands through multiple mobile operators worldwide. This Data Share system could also re-invigorate the old print model that made advertising so lucrative, with data package subscribers providing the same focused consumer market advertisers enjoyed in the days of print dominance. Data Share could allow newspapers to stop worrying about the bottom line and focus on news. Most importantly though, allowing users to purchase data at the source of their data usage changes the value dynamic, with users re-associating data cost with content value. In traditional news industry terms, Data Share puts the newspaper back in the hands of the reader. Why would the telecommunications industry be interested? The mobile telecommunications market is a trillion-dollar business. The data market makes up about 30% of this and it is the fast growing part. While voice minutes are in decline, data usage is sky rocketing. At the same time, web content publishers are increasingly finding consumers are accessing the web through mobile devices, rather than through desktop computers and laptops. A new report from the CTIA Wireless Association estimates that North Americans used 1.1 trillion MB of data between July 2011 and June 2012. While AT&T, for instance, charge between $15-50 per month for smart phone data usage, $180-600 per year for a single user. With over half of US cell phones used to go online, this is an industry worth $20-50bn in the US alone. Added to this are other data packages for home broadband, gaming devices, tablets and roaming. Various studies suggest the average monthly cell phone bill is somewhere between $47 and $80, an average yearly mobile spend of $550-$960. Similarly, in the UK, Oxford-based Billmonitor calculated the average mobile user spends £439 a year on their phone, while also doubling their data usage year on year. 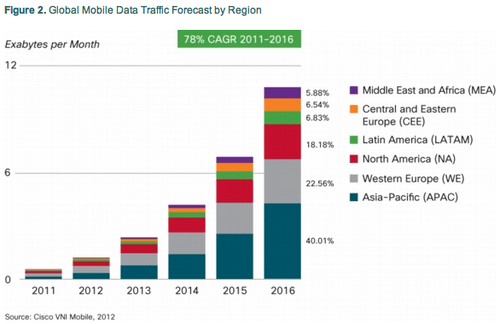 “A whopping 85 percent of the traffic traversing the four nationwide mobile operators networks is pure data, according to a new study by wireless analyst Chetan Sharma, showing that the U.S. mobile industry long ago abandoned its voice mantle to become a data-driven juggernaut. Or has it? Sharma also found that data accounted for only 39 percent of all mobile data revenue that carriers collected in the fourth quarter. Operators may be running what are primarily data networks, but they are still getting paid mainly for voice minutes. Which is no doubt partly why Luigi Gambardella, chairman of the executive board of the European Telecommunications Network Operators (ETNO), defended a proposal submitted to the United Nations International Telecommunication Union that would “require content providers like Apple and Google to pay fees linked to usage”. Speaking at the Technology Policy Institute’s conference in August, he said: “[w]e should have the freedom to make commercial agreements based on the value of the information…[t]his would benefit us because we could have additional revenue.” While this is just a proposal, and one that does not have broad global agreement, it is a sign that the telecoms industry is struggling to economically adapt to the data switch. In fact, mobile operators are frantically searching for ways to make data more profitable. Verison and AT&T have recently adopted ‘Mobile Share’ data plans where users can share their data with family members and across devices. The idea is understood to be “a tool to get more people using data”. With this in mind, Data Share may well be mutually beneficial, for content providers and mobile operators alike. Mobile operators are struggling to make data profitable, while content providers are struggling to generate sufficient revenue from ads to finance the production of quality content. While there is at least one credible innovation in the pipeline seeking to address the “data explosion…through cost transparency and by putting consumers in complete control of tailored mobile services“, it does not address the fundamental issue of supporting content creation. Refining the way users control their data usage, both in terms of scale and supply, is in itself a worthwhile enterprise, but the potential consequences in terms of content design and user accessibility need to be fully explored. Data Share on the other hand addresses both problems, while mitigating the potential for limiting accessibility to those that cannot afford data rich content. Mobile and internet providers may of course resist this plan. Giving up a lucrative monopoly is perhaps not in their long term interests. But there is no getting away from the fact the current system is unsustainable. Data provision cannot and should not remain the domain and profit of a handful of service providers, while those that produce the content – which makes data provision so lucrative – starve of funds. This is why the media industry is best placed to begin the process. All that is needed is to convince their telecommunications advertising partners to sell proprietary data packages, whether that be as part of the basic mobile package build up or as an optional data add on. With the addition of further packages, buy in from competitors and web businesses such as Facebook, other mobile operators would be compelled to join. Eventually, as the system evolves and expands, global brands such the Financial Times and the New York Times will be able to sell packages in numerous countries, and smaller local papers will be able to tap into mobile markets across the planet. This is a broad outline of a potentially revolutionary way to fund internet content creation. One that goes some way to redressing the imbalance at the point of production caused by the decline of the print industry. While also recognizing the unwarranted monopoly of mobile and broadband suppliers over access to the internet and its content. But news organisations shouldn’t celebrate just yet. The internet is not a news stand, users are not choosing between their preferred newspaper or magazine. There are thousands upon thousands of industries represented on the web, the news world will have to compete against all of them. 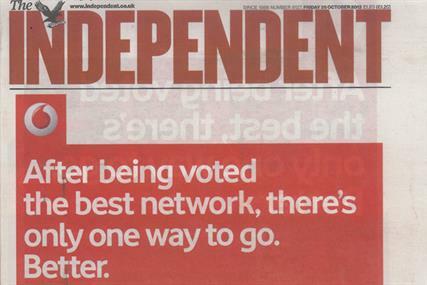 This alternative may, though, allow readers once and for all to choose whether to save the industry or not.